I hear you have a dog in your novel, Programmed For Danger. Tell us about the book. Yes, there is a dog in Programmed for Danger. Mac is my heroine’s beloved companion mutt. When someone asks if he’s friendly, she replies: “Worse. He has a generalized love for humanity that borders on neurotic.” He’s also quite fond of pizza! 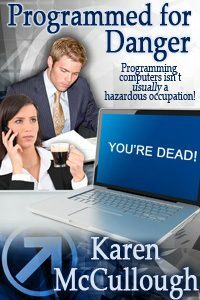 The quick blurb for Programmed for Danger: Computer programming isn’t usually a dangerous occupation, but Andrea Kingston finds herself fighting for both her love and her life when she’s hired to solve Ferverill-West Company’s computer problems. The book was originally published by Avalon Books, but is now available as an ebook from the usual ebook outlets. 2. Why did you add a dog to Programmed For Danger? Gremlin. The pictures are old and somewhat faded, I’m afraid. 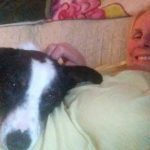 My heroine Andrea has a snug little house in the country, but wanted a dog for protection. What she got instead was Mac, a mutt who loves everyone. Over the years, our family has had a lot of pets, but at heart, I’m a dog person. 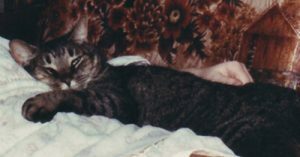 My very first pet, acquired shortly after my husband and I got married, way back when, was a dog named Gremlin. He was part beagle, part dachshund, and very affectionate. 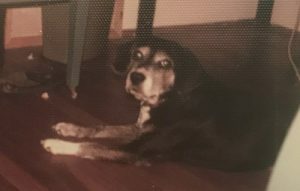 We had him for fifteen good years. Shortly after he died we were adopted by a cat named Tiger Henry who lived in the neighborhood, but in a household where he wasn’t all that welcomed by several already-in-residence felines. The neighbor finally conceded ownership of him to us. Over the years we’ve also had a parakeet, a rabbit, a couple of gerbils, and more hamsters than I can count. Tiger Henry, lying on the couch with my youngest daughter. 3. What other novels have you written? Lots of them! 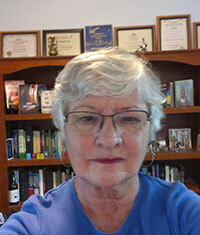 I’ve had fifteen novels published since I sold my first romantic suspense novel to Avalon in 1989. Programmed for Danger was actually the second novel I sold, but a couple of years ago I got rights back to all of my old Avalon books and republished them as ebooks. Since it involved computers, I did an extensive re-write of it prior to re-releasing it. I’ve also had half a dozen or so novellas and a bunch of short stories included in various anthologies and some are now also available as ebooks. 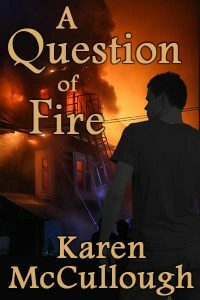 I write and have been published in several genres: romance, romantic suspense, fantasy, paranormal, and mystery. A few of my most recent re-releases are shown below. Argh! I hate beating my own drum. 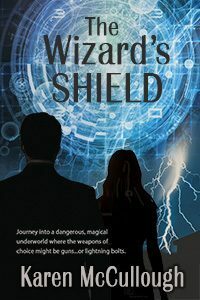 But I’ve won several awards, including an Eppie Award (now the Epic E-book Award) for best fantasy novel (The Rainbow Bridge, now re-titled, Wizard’s Bridge) and a Vixen Award for the book now titled The Wizard’s Shield. I’m a four-time Eppie finalist, and a finalist in the Daphne, Prism, Rising Star, Lories, and the International Digital Awards. 5. 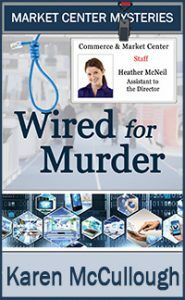 Where can readers learn more about your books and connect with you online? Hi Karen, Love getting to read authors I haven’t before. Can’t wait to pick up one of your books. Have a great day. Hi, Ida! What a cute pooch! Thanks for posting the photo. 😉 Actually, you posted it on my October interview, which was my fault since I mentioned in my newsletter not to go past my September blog post, when I should have said my October blog post. ;-( Sorry. But you and your pup are still in the running to win an ebook! Ida — I moved your comment (minus the “Hi, Karen”) to Leslie’s interview post. Have a great weekend!